We simply adore the UK Quad for. One of the most important Giant Monster films ever, spawning countless remakes and spinoffs. 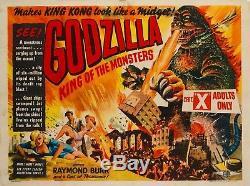 Godzilla who'makes King Kong look like a midget! Remains as popular a character today as he did when he first exploded into cinemas in the 50s. This British poster is incredibly rare, especially in such fabulous unrestored condition. 1956 (First-year-of-release in the UK). UK Quad (30 x 40 inches). Little nicks, wear and aged on edges. Very little paper-loss to top right corner. Writing on back with light bleed-through. Really in fantastic unrestored condition for its age. The item "Original Godzilla, UK Quad, Film/Movie Poster 1956, Gojira" is in sale since Monday, March 26, 2018.